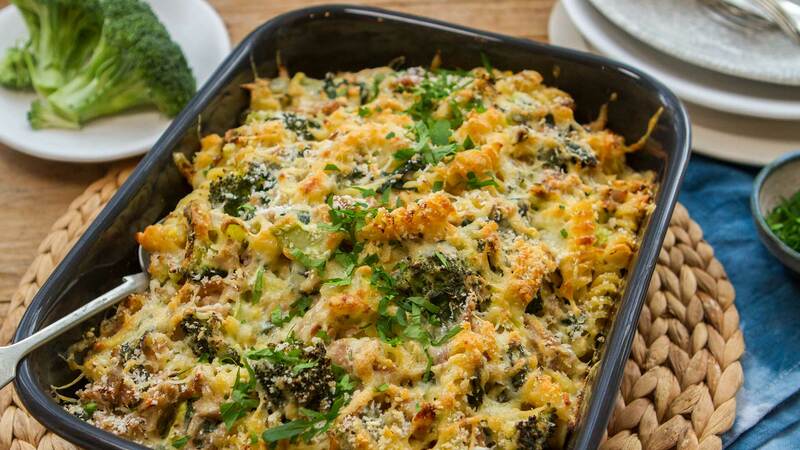 An old-school family favourite, tuna mornay holds a special place in most Aussie hearts and our tuna broccoli spinach mornay is the perfect all-in-one meal! Our version is loaded with vitamin C, rich in antioxidants and omega 3, making this affordable meal tick all the boxes. In a large pan, cook the pasta for one minute less than the instructions on the pack for al dente, so it’s just a little undercooked, then drain. In a deep frying or sauté pan, on a medium heat, cook the onion in butter, stirring occasionally until soft and just changing colour. Sprinkle the flour and stir into the onion & butter, cook for about 30 seconds. Pour in the milk, stirring all the time until smooth and well combined. Bring to a fast simmer, stirring constantly until the sauce thickens. Stir the spinach into the sauce, until it’s just wilted. Remove from the heat. In the pasta cooking pan, fold in the tuna, broccoli florets, sauce, spinach and 1 cup of the grated cheese. Season with plenty of black pepper. Pile the mixture into a large ovenproof dish, then top with the remaining cheese and scatter with breadcrumbs. Bake in the oven for about 25 minutes, or until golden brown on top. Serve hot.